Another month has gone by so it is time for the May edition of the Mustangs Northwest General Meeting. All members are encouraged to attend to hear about the charities Mustangs Northwest supports as well as how planning for the 2018 Roundup is progressing. Guests and new members are always welcome, too! The Mustangs Northwest general meeting is in the Library building of North Seattle College at 7:30 pm on Friday, May 11, 2018. Also happening this weekend are two events the Mustangs Northwest club is involved with. The Mustangs Northwest Spring-into-Summer Judged Car Show at Remlinger Farm in Carnation, WA. Even if your car is not registered for the event, come enjoy some beautiful Seattle weather, your favorite Ponys and the Remlinger Farm Market. See web page and calendar for details. On your way out to Carnation on Saturday, swing by the new Woodinville O’Reilly Auto Parts store for a grand opening car show. 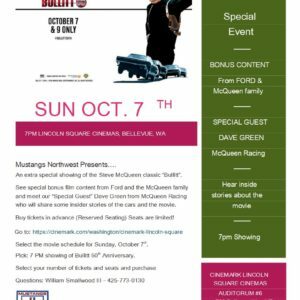 Many Mustangs Northwest club members will be at the O’Reilly show and are always happy to show you their vintage Mustangs. See calendar for details. Help Needed – Looking for a few Mustangs….